NGINX has major skin in this game, but there are many generally useful tips here, including using a reverse proxy server, caching, and HTTP/2. A fast load balancing HTTP(S) router for deploying microservices. Services provide one or more host/path prefixes and Fabio live-updates the routing table every time a service becomes (un-)available. Heroku has open sourced Vegur, the proxy library that handles routing in Heroku’s stack. It’s written in Erlang. Using automated testing? 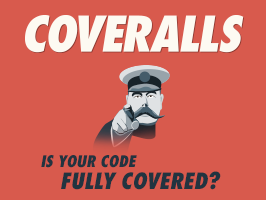 Coveralls helps you deliver better code with coverage history and stats. Line-by-line coverage reports stats to spot gaps where bugs hide. Get notified when coverage changes on your projects. Can't use cloud services? See Coveralls Enterprise. Always free for open-source we are looking for skilled devs to join the revolution. A quick why and how behind NPR’s latest efforts to speed up their site. A quick high level comparison of HTTP 1 and HTTP/2. Copy/pastable SSL configurations that provide strong SSL Security for all modern browsers, helping you get an A+ on the SSL Labs Test. WebP is an image format developed by Google that can provide both lossless and lossy compression. It can trump both PNG and JPEG on size at a similar quality, but Firefox, IE and Safari don’t yet support it. The first 30 minutes are free to watch. An in-depth guide to Content Security Policy and how to use it to prevent cross-site scripting (XSS) attacks on your apps. This is almost an ad, but looks like a useful tool. Identify and resolve application issues before they impact your end users. 15-day free trial. A joke that may indeed be useful. Covers libraries, open source repos, guides, blogs, and other resources. 100+ categorized links to enjoy here.